One of the elements that draws me to my kind of work (hospice) or to a story or in this case a photo, is its mixture of loss and resilience. 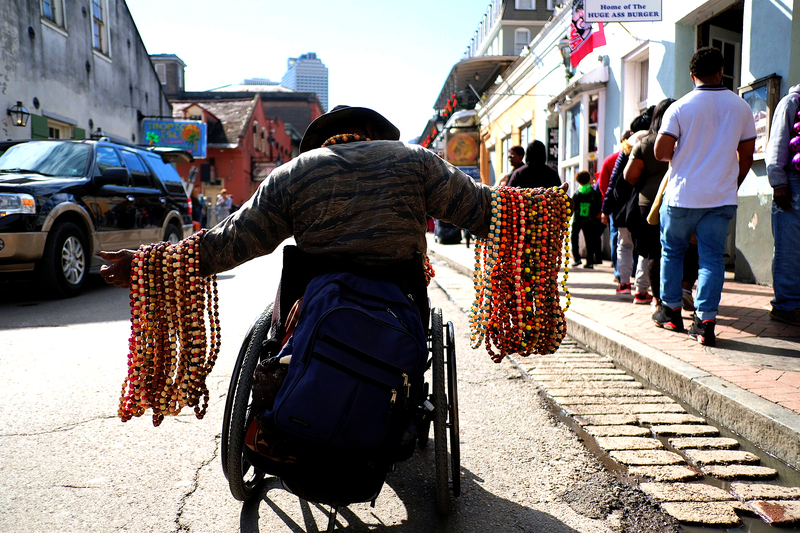 Friend and photographer Jay Martin was in New Orleans during the Sugar Bowl and took this shot of a person selling beads. I invite my site visitors to let the photo speak for itself to you of obstacles versus moving along, of drabness versus color, of frivolity versus labor, of being in the center versus going unnoticed. Do you wonder along with me how he navigated with his arms extended, and whether stretching them out like that was onerous? Jay Martin is a technical and science writer who lives with his wife and cat in San Francisco. He has interacted with photography for over 30 years, taking pictures of people and animals. He thinks he can understand the world a little better than he did the day before by daily observation through the lens. I am departing from my usual format this week, because I was interrupted last week by a life-altering event: my book was accepted for publication! (I will announce the publisher as soon as the ink of the signatures of both parties on the contract is completely dry.) 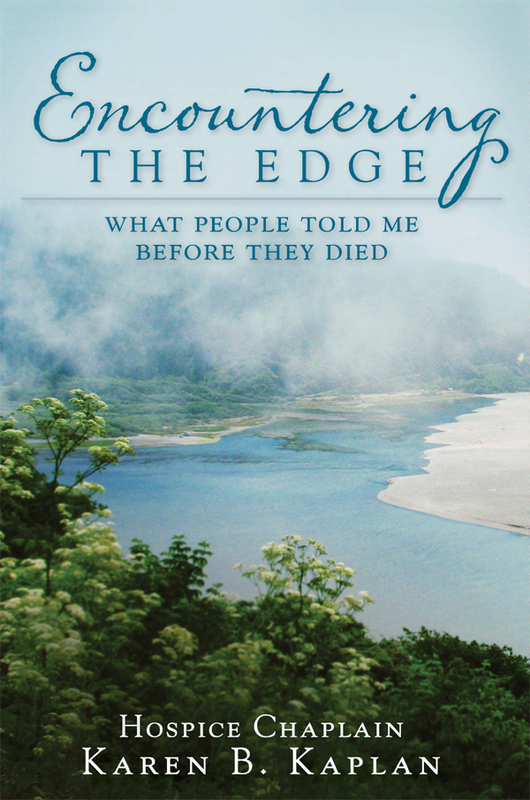 The working title is Encountering the Edge: A Hospice Chaplain’s Memoir. On the heels of receiving the contract, the publisher mailed me an “author questionnaire” and gave me a two-week deadline to fill it out. It has the customary questions about my education, affiliations, current and past jobs and whatnot. But a portion of it in effect says, “Go outside and play.” This is the part I reproduce here for your amusement, giving you all a well-deserved break from facing death. Hobbies: Singing at the slightest provocation, strolling through botanic gardens, speaking Spanish, Tweeting wisecracks to comedians on Twitter and reading compassionate science fiction (no swords or murderous robots). Dream Dinner Guests: Sting, Stephen Hawking, Ruth Ozeki (author of My Year of Meats), and any actor or writer connected with Star Trek. Favorite job: Interim rabbi for Temple Beth Am in Manhattan, where I could write provocative sermons and spend most of my time visiting the sick and dying, all without worrying about the Board of Trustees renewing my contract. Favorite summer job: Security Guard for an all-girl’s dormitory at the University of Texas at Austin. My employer said it was the first time he decided to hire a woman for this job because I had “experience of the world” from having lived in El Salvador, Colombia and Japan. (1) Write the first several drafts for yourself. Then write all the subsequent drafts for the audience. A question for my blog readers: How might YOU answer one of the questions in the author questionnaire? When I told friends, family and Twitter followers I would be starting a blog, they wondered if my anecdotes about people in Act 3 Scene 3 of their lives would be comforting or inspiring. They wondered (and either hoped or feared) whether I, a hospice chaplain, had a religious agenda. Hospice after all is a heavy-duty subject. Chaplains after all are, well, chaplains. Despite this, I have foregone any such goal. There are plenty of other books and blogs that already perform that service. Rather, my purpose in all of my writing is to bring readers close-at-hand to places they are ambivalent about approaching, yet respect their need for space. Rather than perform the distasteful task of selling you a message, I feel my task is to let you see for yourself what hospice patients think about, value, believe, and avoid. My attitude towards the hospice patients and their families is similar. I am not there to promote anything, though my presence may be of comfort. As a quiet nonjudgmental presence, they have full leeway as to what they want out of my visits, whether it be a listening ear, song, prayer, touch, casual chatter, or even simply just sitting silently with them. So one of my definitions of “offbeat compassion” is making room for persons who call upon us for help and letting them freely sort out for themselves how we can be there for them. In the coming months, I will blog about anecdotes about the dying and with grievers, or tell you about my experiences with such groups as a threshold choir (they sing to the dying), my responses to others writing about similar topics to mine, give book reviews, and provide excerpts from my hospice memoir. As this evolves, I look forward to amplifying comments you make and answering questions you may have. I plan to ask you challenging questions too. Who knows, I may give a pop quiz. Since this is my maiden post, above all I want to thank all of you for venturing with me into this sometimes soothing, sometimes strange, sometimes curious, and sometimes funny ride.